[BRAILLE, Louis]. Chefs-d’oeuvre classiques de littérature française. [Spine label]: Littérature française: prose. Paris, Institut national des aveugles, 1874. Stout 4to (259 x 182 mm), 2 unnumbered leaves. 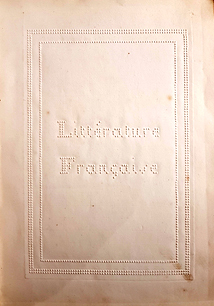 (title printed in relief with the indication ‘Littérature Française’, and one leaf printed in round characters with the indication ‘Ecriture des aveugles. Procédée de L. Braille’), 110 unnumbered leaves printed in relief on rectos only; contemporary cloth-backed boards, spine label printed in relief in round characters. The books forms volume ten of the “Chefs d’oeuvre classiques de littérature française” and contains fourteen extracts of the following authors: Jacques-François Ancelot, Jules Michelet, Jean-Jacques Ampère, Emile Littré, Silvestre de Sacy, Saint-Marc Girardin, Henri Lacordaire, Victor Hugo, Charles-Augustin Sainte-Beuve, Désire Nisard, Henri Martin, Montalembert, Jules Sandeau, and Lucien-Anatole Prévost-Paradol. 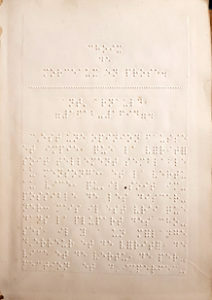 This very instructive book opens with a title page printed in relief in pointillé, but set in a manner to become characters readable for sighted reader; the following page is printed in relief using the same round characters used by Braile for the seminal Procédé pour écrire les paroles, la musique, et le plein chant au moyen de points … (Paris 1829), and resemble a Rosetta Stone as it contains a concordance between regular characters and their transcription into Braille’s alphabet. 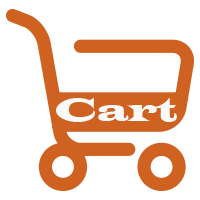 As in the previously demonstrated by Hauÿ, the pages are printed on rectos only.